Is Nokia Lumia 800 a windows based phone? What are the specifications of the phone? Re: What are the specifications of the Nokia windows phone Lumia 800? Yes, Lumia 800 is a new windows based phone from Nokia. The phone has lot of super cool features. The phone runs on a Windows Phone 7.5. It supports HTML, CSS3 and other major web development projects. The phone comes out with 512 MB programmable memory and 16GB internal memory. It comes out with a 3.7” ClearBlack AMOLED display. It also has a captive touch screen and the latest Pinch Zoom technology. it supportable all computer languges. social networking by a click . led screen n touch . 16 GB memory for internet. it a window phone also. 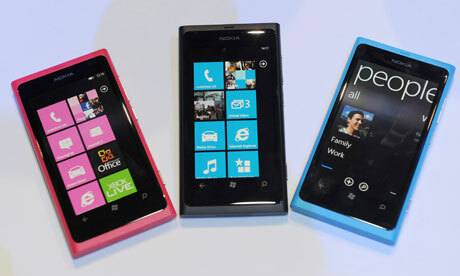 The Nokia Lumia 800 is a new Windows phone launched by Nokia. The phone runs on Windows mango version. The phone comes out with an 8 MP rear end camera. The design provides a 3.7 inch display. The devices almost have the apps of almost all major social networking sites built in to it. The new nokia Lumia 800 has the Mango Operating, it has less weight, it has all the browser of all the networking sites. It has the 3.7 inches display 8 Mega Pixal cammera, it has one of the best battery backup. It has led screen touch, It supports the Html, Css3, many of the web deplopmet project pages, it has 512 MB RAM. It has more coll features then the other window phones. nokia lumia 800 is a awesome windows phone which comprises varies features....it has AMOLED touchscreen and has 512MB RAM ,and contains 16GB internal memory also it has 8MP camera for the sharp and high quality images and has great zoom capability as well . The Nokia phone is the windows mobile named as Lumia 800 and it supports the windows OS and you can use it like a windows desktop and you can access the internet through it and listen and enjoy the music with it and mainly it can be used for the official use and also as a pocket PC so you can enjoy with the Lumia 800 from Nokia. Friend, Nokia is Coming up with the Mobile of Windows Operating System. It is of Pocket PC and is 8 MP Camera. It is just like Windows System in your Home. You can have all the applications as you have in the Desktop or Laptop. It uses the Mango Version which can support Fast Internet and many Features. 8 Mega Pixel Dual LED Flash. 7-Its Size is 116.5 mm x 61.2 mm x 12.1 mm (LxWxT) / 76.08 cc and weight is about 142 gm. 11-It has a battery of 1450 mAh. yes ,Nokia Lumia 800 is a windows based phone. >> MEMORY STATUS OF PHONE:- Dear its internal memory is 16 GB and it does not supports the external memory card. >> BATTERY BACKUP OF PHONE:- Dear it contains li- ion battery having capacity of 1450 mah and having battery backup in stand bi 256hours and talktime battery backup is 780 minute. >> CAMERA:- It contains only one camera and is of 8.1 megapixals. >> CONECTIVITY ISSUE:- IT HAS THE FOLLOWING CONNECTIVITY MODES. >> MESSAGING:- SUPPORTS THREE KINDS OF MESSAGING PROCEDURE. OPERATING SYSTEM:- WINDOW PHONE 7. SO DEAR THESE ARE SOME DETAILS REGARDING YOUR PHONE NOKIA LUMIA 800. Lumia 800 is a new windows based phone from Nokia. The phone has lot of super cool features. ~The phone runs on a Windows Phone 7.5. It supports HTML, CSS3 and other major web development projects. ~The phone comes out with 512 MB programmable memory and 16GB internal memory. ~It comes out with a 3.7” ClearBlack AMOLED display. It also has a captive touch screen and the latest Pinch Zoom technology. there are so many features Nokia windows phone Lumia 800 . 1.it is supported all windows softwares. 2.it is supported all applications. 3.you can do fast internet in this phone. If you want to know that specification of nokia windows phone lumia-800..So i will show you the all the specifications of the nokia windows phone lumia-800.. So you just see have a look on the specifications..
3.7'' AMOLED ClearBlack Touch Screen , Windows Phone 7.5 Mango OS , 8 MP Camera with Dual LED Flash , 3G & Wi-Fi Connectivity , 1400 MHz Qualcomm MSM8255 (WCDMA) Processor , 16 GB Internal Memory , Micro SIM Feature.. These are the specifications of the nokia lumia windows phone..
1. The phone should run on mango version. 3. 8 MP rear end Camera. 4. Apps of almost all social networking sites. Gprs 3G and 2G supports. >It is enabled with both 2G as well as 3G network. >The body dimension of the phone are 116.5 x 61.2 x 12.1 mm. >The resolution of the display is 480 x 800 pixels. >it has got GPRS as well as EDGE and GPS facility as well. >It has got ab 8 MP camera which can record video of 3264x2448 pixels. >It has got 1.4 GHz Scorpion Processor. >it has got a 16 GB internal memory with a 512 Mb RAM. The video below shows the unboxing and physical features and the full review of the phone. The Specifications of Nokia Lumia 800 is. Bluetooth 2.1 + EDR, WLAN IEEE 802.11b/g/n. Syncronization: Zune PC SW, ActiveSync. Lumia 800 is a new windows based phone from Nokia. The phone has lot of super cool features. The phone runs on a Windows Phone 7.5. It supports HTML, CSS3 and other major web development projects. The phone comes out with 512 MB programmable memory and 16GB internal memory. It comes out with a 3.7” ClearBlack AMOLED display. It also has a captive touch screen and the latest Pinch Zoom technology. These all are the features of the Nokia Lumia 800. I hope these information is helpful to you. the Nokia Lumia 800 phone is available in India at a price starting from 17,000 Rs. >the sim card slot of the phone is of Micro-SIM. >the phone has got a AMOLED capacitive touchscreen. >it has got a 16Gb internal storage capacity. >Nokia Lumia 800 has got a * megapixel camera. >the phone is powered by Microsoft Windows Phone vision 7.5 Mango and is upgradable upto version 7.8. >the phone has got a 1.4 GHz Scorpion dual core processor. >the camera is also enabled with Geo-tagging feature. Yes, Lumia 800 is usually a new microsoft windows based mostly cell phone out of Nokia. The unit provides wide range of extremely neat features. The unit is run on your Glass windows Cell phone 7.5. This facilitates HTML, CSS3 and also other key web design projects. The unit occurs by helping cover their 512 MB programmable reminiscence and 16GB bodily memory. It will come outside having a 3.7” ClearBlack AMOLED display. It also contains a captive touch-screen and up to date Little Focus technology. I am providing you the specifications of Nokia Lumia 800. For more specification and feature browse Nokia website.